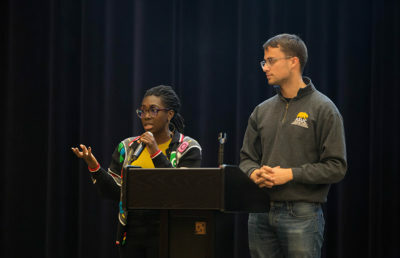 Berkeley Forum President Daniel Ahrens said this semester’s lineup will include more representation of fields such as biotechnology and information sciences, allowing students to engage with speakers on a wide range of issues. “I think we really did a good job of exploring issues that we maybe haven’t explored before and bringing really amazing speakers who are at the forefront of their field — fields Berkeley students might not typically hear from,” Ahrens said. 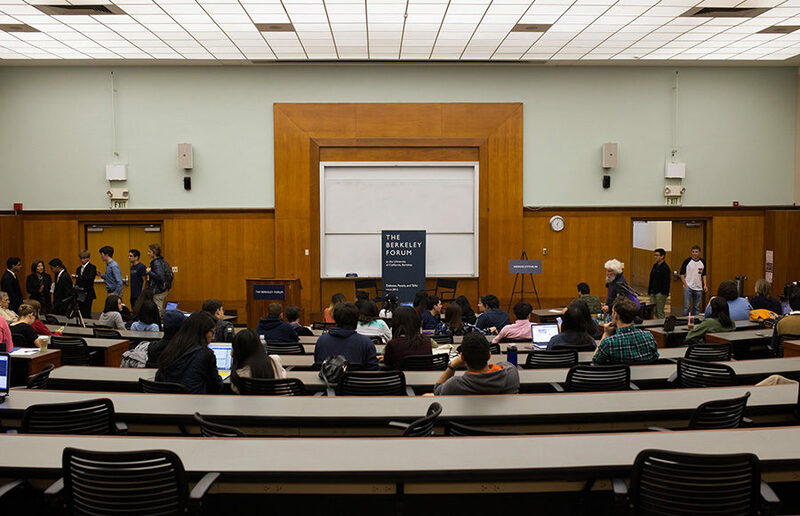 The Berkeley Forum undergoes an extensive planning process to host speaking engagements, reaching out to potential speakers via phone and email a semester in advance. 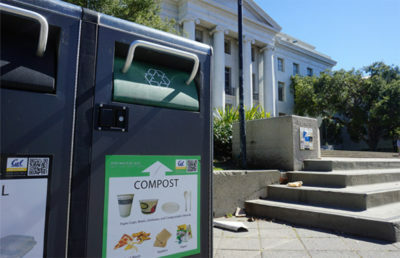 Since its founding in 2012, the forum has hosted notable figures such as UC Berkeley professor Robert Reich, U.S. Secretary of Homeland Security Jeh Johnson and founder of Noah’s Bagels Noah Alper. 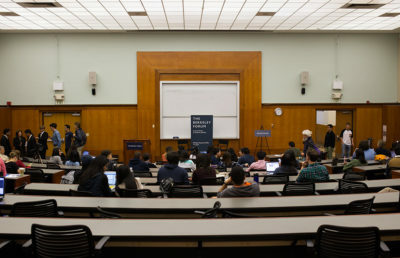 Berkeley forum events, as they grow in popularity, are attended by many students, although some engagements in the past have featured speakers raising controversy. Events featuring figures such as Johnson and UC Berkeley Chancellor Nicholas Dirks drew student protesters in 2015. According to Ahrens, the 2016 presidential election played a moderate role in furthering the forum’s mission to feature speakers on campus who encourage students to see opposing perspectives on an issue. Of the figures listed in this semester’s lineup, Ahrens said he is most looking forward to hosting 14th Librarian of Congress Carla Haden and Twitch.tv founder Justin Kan.
“I’m just excited to have the opportunity to break ground on a lot of these issues and bring them to the student body — and (that) these speakers have the opportunity to engage with students and students have the opportunity to engage with them,” Ahrens said. On Tuesday, the forum will host a talk by David White discussing how to protect creative professionals during the “gig age,” a period characterized by fluctuating job opportunities in the entertainment and media industries. White was appointed the national executive director and chief negotiator of the SAG-AFTRA in 2009 and has since spearheaded cost-saving and administrative improvements to alleviate financial circumstances within SAG and the media industry. From 2002-06, White served as general counsel to SAG-AFTRA and worked as a consultant to the entertainment industry. 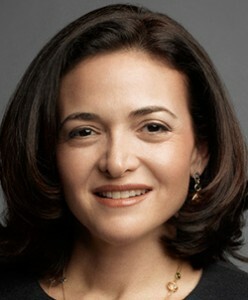 White, who is a Rhodes scholar, graduated from Grinnell College and Stanford Law School. As the senior vice president and the national political director at the U.S. Chamber of Commerce, Rob Engstrom is responsible for leading the Chamber’s national grassroots and election-related efforts. On Thursday, he will deliver a talk at the forum about growing the U.S. economy in its current state. Engstrom oversaw the voter-education campaign in the Chamber in 2014, resulting in the largest pro-business majority in the House of Representatives since 1928 and the first pro-business majority in the Senate since 2006. In addition, Engstrom manages all member activities for the Chamber’s Federation, which comprises state, local and metro chambers of commerce as well as trade and professional associations. An assistant professor in the Middlebury Institute’s Graduate School of International Policy and Management and a fellow at the James Martin Center for Nonproliferation Studies, Philipp Bleek teaches about the implications behind chemical warfare. His talk in February will focus on the causes, effects and solutions to situations of chemical warfare in Syria. From 2012-13, Bleek acted in the role of senior adviser to the assistant secretary of defense for nuclear, chemical and biological defense programs. He also worked to raise awareness of chemical warfare’s impacts and represented the United States in a White House-led dialogue with the Russian Federation on Syrian chemical warfare. Known for founding the SENS Research Foundation, an organization that researches regenerative medicine and its uses repairing damage caused by aging, gerontologist Aubrey de Grey will deliver a talk about rejuvenation biotechnology and its impact on age. De Grey is also the editor in chief of the scientific journal Rejuvenation Research and a fellow of aging research organizations Gerontological Society of America and the American Aging Association. He also sits on the editorial and scientific advisory boards of several journals and organizations. He has a bachelor’s degree in computer science and a doctorate in biology, both from the University of Cambridge. Bioengineer Feng Zhang’s name and title may ring a bell on campus as the scientist involved in a multiyear CRISPR-Cas9 patent dispute with UC Berkeley’s Jennifer Doudna. The breakthrough technology, potentially worth billions of dollars, opens the door for highly reliable DNA-sequence modification. The original rights were awarded to Zhang, giving his research center commercial control over CRISPR-Cas9, while the Doudna Lab contends that it made the discovery first. The U.S. Patent Office has not yet issued its final decision on the rights. Writers Guild of America President West Howard Rodman, who is also a seasoned film and television screenwriter, will be visiting The Berkeley Forum on March 6. Rodman is set to deliver a presentation on the need for a union for television writers. Rodman founded the Writers Guild Independent Writers Caucus and is the former writing division chair of the USC School of Cinematic Arts. He has worked with David Lynch, Errol Morris, Chantal Akerman and David Siegel, among others. Carey Perloff, the artistic director of the American Conservatory Theater, or ACT, will deliver a talk at the forum March 21 on the role of theater in the 21st century. Perloff has been the artistic director of the ACT since 1992. Under her tenure, the ACT created a new core company of actors and revived the master of fine arts program. Perloff published her book “Beautiful Chaos: A Life in the Theater” in 2015, and it serves as a memoir of her career in the theater. The 14th Librarian of Congress, Carla Hayden, is speaking at the forum April 5. Hayden graduated from the University of Chicago Graduate Library School with both master’s and doctorate degrees in Library Science. She became the director of Enoch Pratt Free Library in 1993 and was praised and admired for keeping Baltimore’s libraries open during the 2015 protests in response to the death of Freddie Gray. Hayden served as president of the American Library Association from 2003-04 and emphasized the theme of equity during her tenure. Former President Barack Obama nominated Hayden to serve as the 14th librarian of Congress in February 2016. She was sworn into the position in September and is both the first woman and the first African-American to hold the position. On April 6, Justin Kan, an internet entrepreneur with a history of selling companies for millions of dollars, will be speaking at The Berkeley Forum. Founded in 2011, Twitch.tv — a video game streaming platform — has become one of the world’s largest online communities for gamers. In 2014, Amazon bought the company for $970 million. Previously, Kan sold his mobile-video-sharing app Socialcam for $60 million. He is also a partner at Y combinator, a company that invests money in a large number of startups twice a year. On April 11, Berkeley Forum will hold a panel on student debt, featuring author Sandy Baum, policy analyst Robert Hiltonsmith and American Student Assistance official Kevin Fudge. Baum wrote the book “Student Debt: Rhetoric and Realities of Higher Education,” which, according to its description, is intended to “(expose) how misleading the widely accepted narrative on student debt is.” Baum is also a senior fellow in the Income and Benefits Policy Center at the Urban Institute and a professor emeritus of economics at Skidmore College in New York. Hiltonsmith is a senior policy analyst for the public policy organization Demos, where he has written about fiscal policy, health care and labor. He has a particular interest in retirement security in the United States and how it affects youth. His research has been covered by major news organizations, including The Washington Post and Reuters. Fudge is the manager of government relations and community affairs at American Student Assistance, a private nonprofit intended to help students navigate education financing. Fudge has spoken about student debt to The Wall Street Street Journal and NPR. Erwin Chemerinsky, the dean of the UC Irvine School of Law, will address the forum April 12 on historic failures of the U.S. Supreme Court. Chemerinsky is the founding dean and Raymond Pryke professor of First Amendment law at the UC Irvine School of Law, with a joint appointment in political science. He has authored 10 books, including “The Case Against the Supreme Court,” which was published in 2014, and two books that will be published in 2017. Chemerinsky regularly argues appellate cases and has argued before the Supreme Court. In January 2017, National Jurist named Chemerinsky the most influential person in legal education in the United States. Don Carson, a theme-park and visual-world designer, will speak at the forum April 19. Carson is a former senior show designer for Walt Disney Imagineering, the theme-park design arm of the Walt Disney Company. During his time at Disney, Carson served as the lead designer on Splash Mountain for Walt Disney World and as one of the lead designers for Mickey’s Toontown in Disneyland. Carson is now an art director at The Hettema Group, an experiential design firm specializing in themed architecture, and he works with Walt Disney Imagineering on a freelance basis. Albert Bourla will deliver a talk presenting his perspective on the pharmaceutical industry from his experiences as the executive vice president of Pfizer, a prominent biopharmaceutical company. During his past 20 years with Pfizer, Bourla has served as group president of Pfizer’s Global Vaccines, Oncology and Consumer Healthcare business, and has led strategization efforts regarding Pfizer’s off-patent portfolio. Albert is a doctor of veterinary medicine and received his doctorate in the biotechnology of reproduction from Aristotle University’s School of Veterinary Medicine. UC Berkeley has seen its fair share of sexual harassment investigations in recent months, making Emmy-winning and Academy Award-nominated producer Amy Ziering’s appearance on campus ever more timely. “The Hunting Ground” (2015) focused on the prevalence of sexual assault on college campuses, including UC Berkeley, while “The Invisible War” (2012) covered sexual assault in the military. When “Til It Happens to You” from “The Hunting Ground” was nominated for best original song at the 2016 Academy Awards, two UC Berkeley-affiliated individuals joined Lady Gaga onstage. Ziering’s talk will center on sexual assault on college campuses.